The perfect size for small batches! 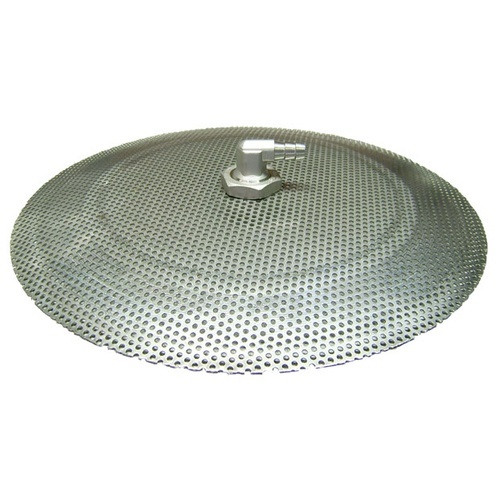 This false bottom fits great inside a 5 gallon beverage container, like our Rubbermaid coolers, or any container with at least a 9" opening at the top - such as a bucket. It can handle a heavy load of grain. It provides enough strength and space to allow your wort to run through without any channeling of the grain bed. It works flawlessly sparging even sticky mashes! Made from stainless steel with 3/32” perforated holes on 5/32” centers. 3/8" barb for tubing connection. It's a 9 inch false bottoom. The first time I tried it, grains managed to slip past the edge, resulting in a plugged drain line. It was a mess. I believe I solved it by taking a slit piece of plastic hose and wrapping it around the edge of the false bottom. That seems to seal off the grains and raise overall height by about 1/8", which should help with the flow. I haven't brewed with this configuration yet, but a test with spent grains did not clog it, so I think it is a good solution. Perfect fit for 5 gallon round coolers. Nestled perfectly in the bottom of my 5 gallon igloo water cooler. Well made, decent price. Will serve me well. Great product. Was looking for a cost effective false bottom. The edges are pretty smooth and works well!